5 Essential Autumn Lawn Care Tips | Dean Bjorkstrand Inc.
We should never underestimate just how important it is to maintain our lawns. Aesthetically, lawns increase property values, complement landscape plants, and can even enhance the quality of our lives. A lush green lawn provides a blanket for families to picnic on, a soft landing for children at play and a soft cushion for bare feet. Scientifically, a healthy lawn is great for the environment because a it generates oxygen for improved air quality. The grass ecosystem acts as a filter for the environment, thus reducing air pollution and noise in suburban areas. When it comes to property value, a healthy lawn improves curb appeal and can increase the value of your property by 15 to 20 percent. 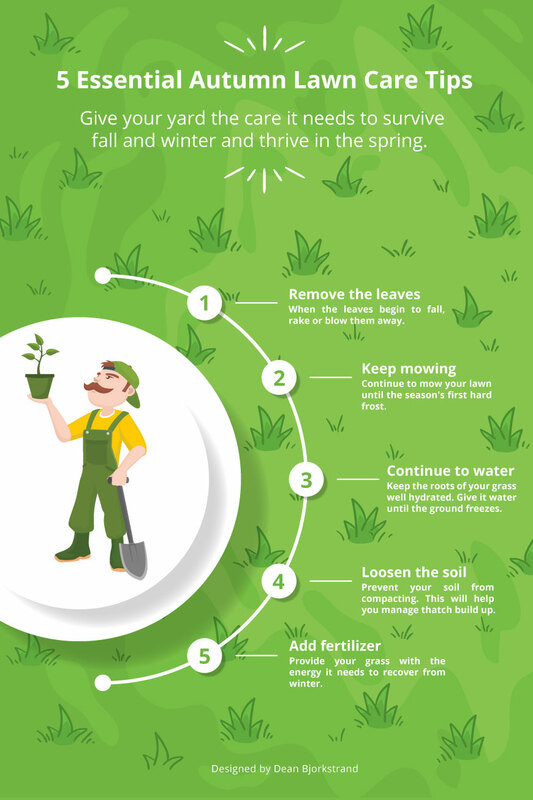 The following tips will help ensure your springtime lawn is thick and healthy. There is probably nothing nicer than seeing a lawn sprinkled with red and yellow leaves, but unfortunately fallen leaves can lead to a very unhealthy lawn. Leaves become wet, stick together and suffocate your precious turfgrass. With each passing day your lawn receives less and less sunlight. Dead, moist leaves are an invitation to mold and lawn diseases. Regular raking is an absolute must during fall. Fallen leaves can be disposed of by composting or used as mulch around rosebushes and other plants. Continue mowing your lawn through fall. It will keep growing right up to the first hard frost. By late fall the blades on your mower should be dropped down by 1 to 2 inches. Continue mowing at this height until early winter when the lawn stops growing. Dropping your mower blade should be done gradually. A dramatic drop can impede root growth and lead to grass discoloration. Not only does regular mowing keep your lawn looking neat and tidy, it chops up unwanted leaves and deposits them as a soil-enhancing mulch. Although the temperature may be cooler during this time of year, your lawn still needs watering. While we understand there may be more dew, more rain and less evaporation in the fall, it may not be sufficient to ensure the grass roots stay healthy and well hydrated going into winter. Your lawn will continue growing throughout the fall, so if your lawn is not receiving a minimum of one inch of water per week, keep your irrigation system or sprinklers running until the end of October. Watering your lawn will sustain growth, so continue watering until the ground becomes cold and begins to freeze. One of the most important aspects of a well-maintained lawn is aeration. Aerating is the act of spiking or punching holes through the lawn to allow nutrients and air to reach the grass roots. Aeration reduces soil compaction and is vitally important for helping your lawn survive extreme conditions such as drought or waterlogging. Aeration assists with water preservation – as well as root development – and it allows oxygen to break down organic substances. It helps fertilizer nutrients quickly reach the root system. It is recommended that a core aerator be used because it solves many problems by punching holes through the lawn and pulling up small plugs of soil. Fertilizing during fall will make the difference between an ‘okay’ lawn and a truly spectacular one. Adding fertilizer with a mixture of potash and nitrogen offers the perfect medicine for a lawn that has been damaged by drought and/or the summer sun. Just before winter, fertilize your lawn again to assist with root establishment. Once winter arrives fertilizer treatment can no longer be applied. Taking good care of your lawn during fall can improve your lawn’s capacity to store nutrients whilst simultaneously fending off plant diseases and fungi. Not only will your lawn look nice during fall, it will be well prepared to take care of itself during the coming winter season. What Type of Grass Should You Use on Your Lawn in Minnesota? This entry was posted in Landscape Design. Bookmark the permalink.